When reading the LCN text in its Starea section it is quite surprising that so many Peleio distance/directions are included. Indeed, the text commences with two Peleio from Cape St Vincent, one to the Seville River and the other to Septa (Ceuta), the southern Pillar of Hercules. The fact that they are slightly awry, as already explained in ChLCN/1 matters little in this context as the intent here is merely to illustrate the choice of Peleio included within the Starea section the originator thought relevant. It should be noted that many re-appear in the main Peleio section and from that fact we can consider perhaps an attempt at integration of the two parts of the text in these latest editions. But the timescale of LCN, as discussed in ChEPC/1 must play a large part in determining the extant version we read today, whether it is the final version still remains to be determined. 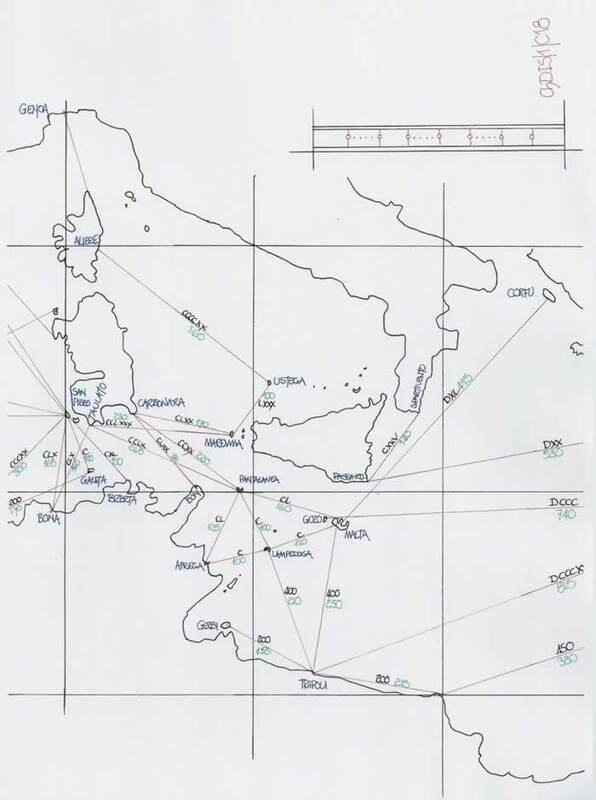 But, when the area south of Sardinia is discussed as already shown in text ChCPC/1, it becomes patently clear that the main Peleio section is of prime import for setting out a chart matrix, but it also contains the most horrendous scribal errors causing the entire chart to be unnecessarily slewed to the northeast. Thus a complete assessment of the Peleio is necessary and the determination of the slewing effect to negate the often written comment by other researchers and historians that this slewing is the magnetic effect being somehow introduced onto the charts format. Nothing could be further from the truth as the 10 charts reviewed will clearly indicate. But I repeat a comment I have made before; I am not endeavouring to rewrite the LCN text, it is what it is and must be treated accordingly, but the original must be found. The five diagrams illustrate the Starea Peleio but do not have every one of the 73 routes appended. That is merely because several are inconsequential as there are no ports for a Starea description and are thus no more than basic empty length of coastline. Commencing with diagram ChDIS/1/D01, the western section both sides of the Pillars of Hercules, the major landmarks are all utilized just as they are in the Starea text. There is nothing remarkable in their choice except a greater degree of inaccuracy in the distances when compared to the whole LCN text. That of course immediately leads to the simple possibility of many more scribal errors. Thus from Capo de Pali to Gibeltari is given as CCC millara, but geographically it is very close to CCL millara, being in fact CCXL. The next, Capo de Pali to Capo de Gata is given as CLXX, but is actually CXXX. Unfortunately in this day and age accuracy is a burden, a tool to be used judiciously when discussing ancient measures and not just a bland comparative statement. However, as I have commented previously these do indicate the simplicity of scribal errors occurring when using Roman numerals which I believe is the main cause of the distortion within Portolan Charts. The north western Mediterranean Sea area between Iberia and Sardinia appears to have been spared major scribal errors and the Peleio are acceptable distance/directions. But with six being from Marsellia and four from Acque Morte it is worth investigating the reason. I must here comment though that it is impossible to see 60 miles at sea from a medieval ship and thus the text should read that they sighted land, probably the southern part of Sardinia, which could be said to leave some 60 millara to sail to Cagliari. Sadly however this journey was to see the demise of King Louis IX who died in Tunis of dysentery. 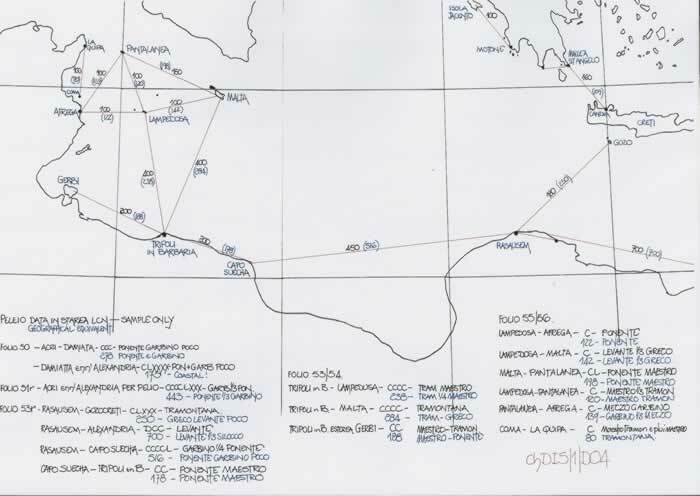 Thus we see the Starea Peleio routes indicating just this sailing possibility, as the route from Grapparola to San Piero and Sardinia would have been around three days on a due east course. Thus the whole route so far would have been quite simply, sail due south from Aigues Morte to the Balearics and then due east to Sardinia. There was no requirement for great navigational feats and thus from the map the mariners only had to point to the due east course, having an idea of their travel distance and state we are near Sardinia. However there is also the possibility, that the Peleio route was first used by King Louis IX for the 7th crusade in 1248AD. This was to capture Damietta, curiously a city which was fought over twice and this time lost forever and so fortified by the Mamluks that it was never again used by the crusaders, as is discussed later. Thus for this storyline to progress we must cross the Mediterranean Sea in an easterly direction. 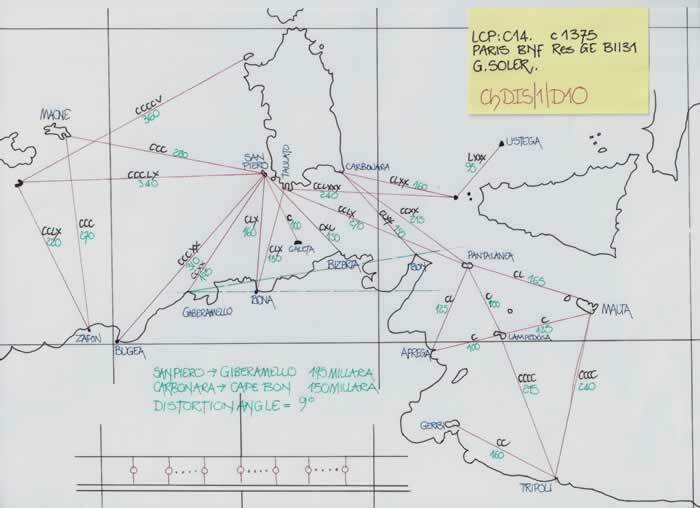 Thus on diagram ChDIS/1/D02, one would expect there to be Starea Peleio to link through the Sicilian Channel, but the area for Italy and the Adriatic Sea is rather devoid of routes, and maintaining a course linking these areas. 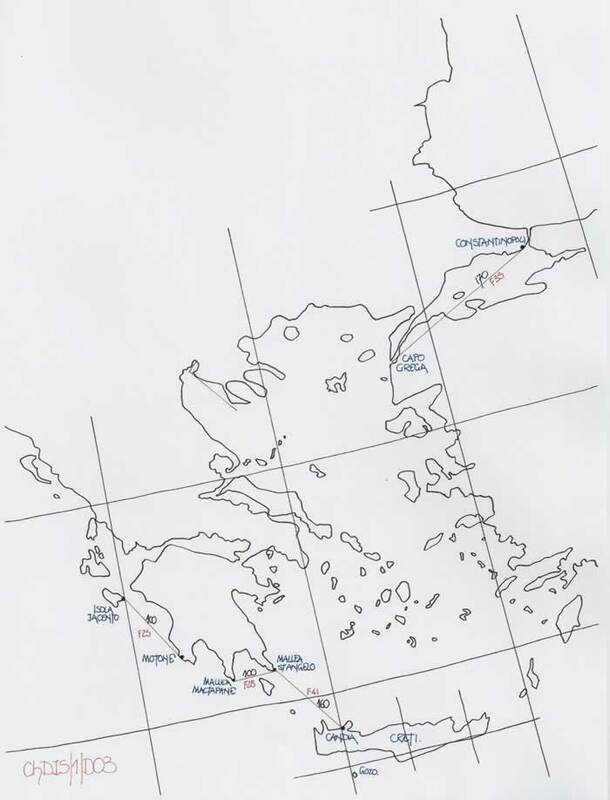 If sailing for the Levant was to be indicated, the Starea Peleio section would provide for a northern route via Greece etc., as appears to be the information written and illustrated on diagram ChDIS/1/D03. However, the southern and eastern sections of the Mediterranean Sea perhaps do indicate the simplest of routes to the Levant. 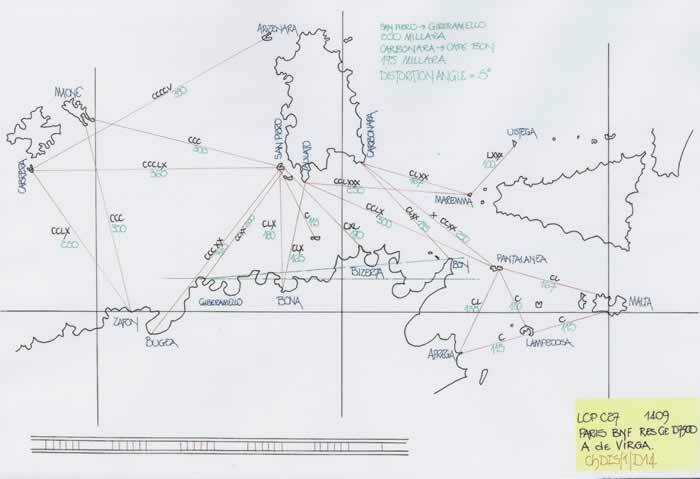 Diagrams ChDIS/1/D04 and D05 indicate Folios 50 to 56 of the LCN Starea Peleio section. Basically it is the reverse routing from Acre in the east to Pantalanea and the Sicilian Channel leading to Sardinia and the western Mediterranean Sea. On the diagrams I have appended both the LCN distances and directions and the geographical equivalents. The question to be addressed is, would medieval mariner’s sail direct from Pantalanea to Gozomalta to Gozocreti across a large expanse of open sea and thence via Rhodes, Castello Rosso to Cyprus, San Beffano and Gavata, and thence to Acre, or would they take the simpler route, Pantalanea, Lampedosa, Tripoli, Suecha, Rasausem, Alexandria, Damietta to Acre, the coastal Starea Peleio route which is fully detailed in LCN? Historically in 1249 the 7th crusade under Louis IX of France landed in Egypt and captured Damietta. Hence we have a Starea Peleio for Damietta, but its inclusion as a Starea Peleio probably commenced in the 12th and 13th centuries when in 1169 the first attempt to capture it was made. But Acre was not captured until 1191 and it could be argued that the inclusion of Damietta is more likely for the 1217 attempt which finally ended in its capture in 1219, but it was quickly lost again in 1221 with the ending of the 5th crusade. Thus although Acre was basically in the hands of the Crusaders for 100 years, 1191 – 1291, Damietta after 1221 was a port unavailable to western mariners until 1249, but then only for two years. Therefore, it is quite acceptable to opine that the Starea Peleio sections of LCN were in a constant state of flux (again as already stated) and the resultant of many “different” LCN’s being combined, all data included and never revisited when times changed. That is continuous copying with little adjustment, but indicates a very early date for the LCN. Thus I return to my ChEPC/1 timescale and restate that I consider the original LCN was updated over several centuries, perhaps the last being 1296AD, but by a person or persons who were merely scribes with no actual knowledge of the Mediterranean Sea coastline or even its historical base, they were merely copyist scribes. 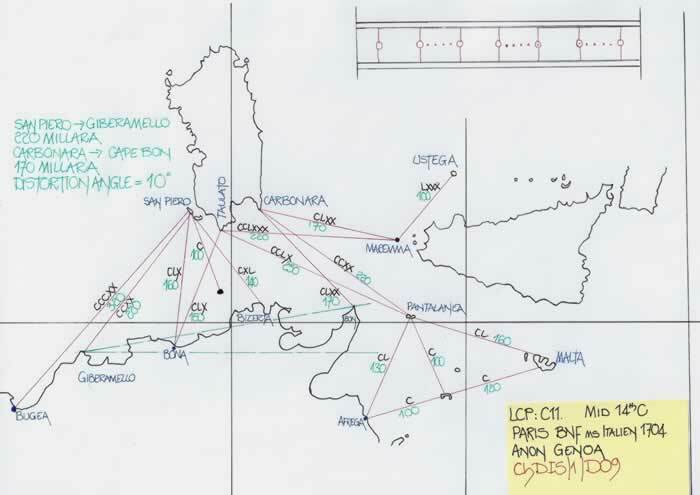 I am referring in this section of text to a schedule, “LCN Discrepancies that twist the map; details from South of Sardinia,” which is included as the appendix, but I here include the complementary diagram, originally ChCPC/1/D10, which illustrates the LCN distances drawn to a geographical map. 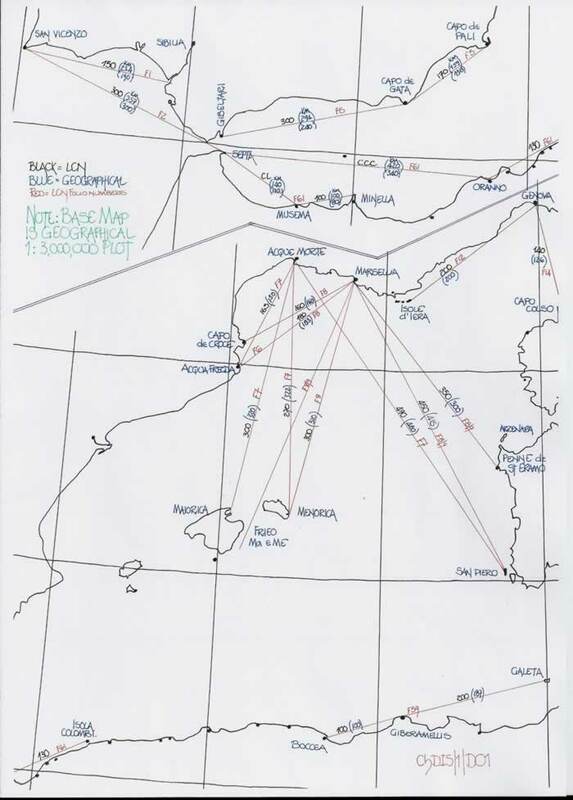 There are 14 such distance/direction routes tabulated and drawn which conclusively indicate that the errors within the LCN text are the only reason for the slewing of the chart, in this instance by some 12 ½ degrees rotation to the north east. Thus there is no magnetic deviation in a chart. 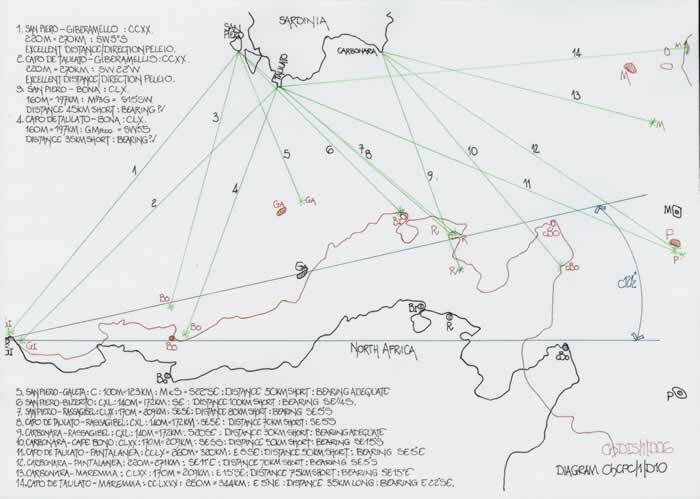 Therefore, if we examine the 10 charts chosen, merely selected as opportune from LCP such that the area south of Sardinia could be adequately portrayed, it should come as no surprise that they are all based upon the corrupt LCN data from one version or another and are thus distorted. But, given the inexactness of the various draughtsmen involved to precisely draw the distances noted then the variety of slewing angles noted by previous researchers and called variable magnetic deviations can be shown as pure errors and negate any such description. 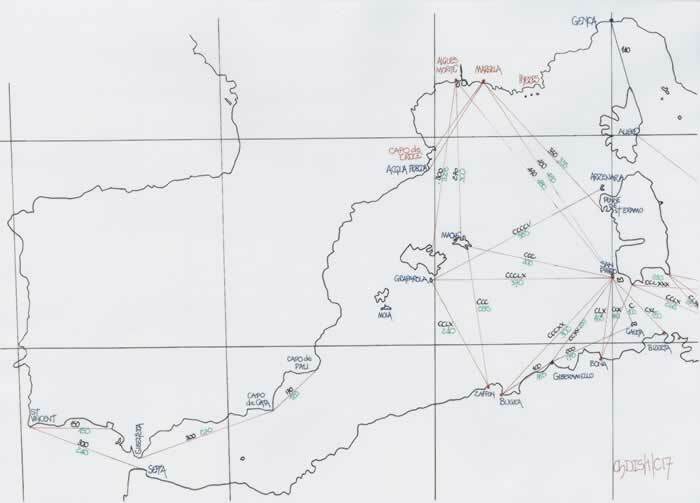 Simply put, observe the positions of the North African coastline, those correctly positioned and the errors from Giberamellis to Cape Bon and the angle is shown. 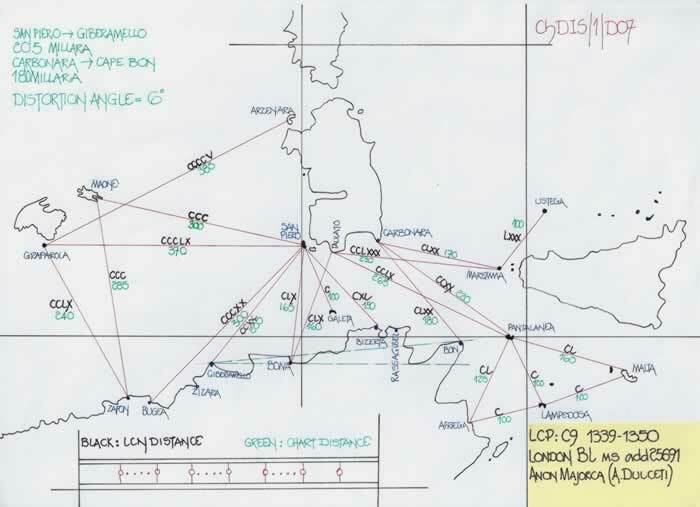 Thus Carbonara to Cape Bon is drawn on each chart and noted within LCN as 170 millara or 204Km. But it is actually 212 millara or 260Km. It is drawn varying from 150 to 180 and even 195 millara on C27 and thus the varied slewing of the charts is assured. The western Mediterranean Sea, San Piero to Bugea and Giberamellis and thence to Cape Bon are short. At Cape Bon there is a 32 millara discrepancy. Bugea to San Piero and Giberamello are quite accurate, but Carbonara to Cape Bon is 42 Millara short. This chart has similar measurements to the LCP C10 chart. 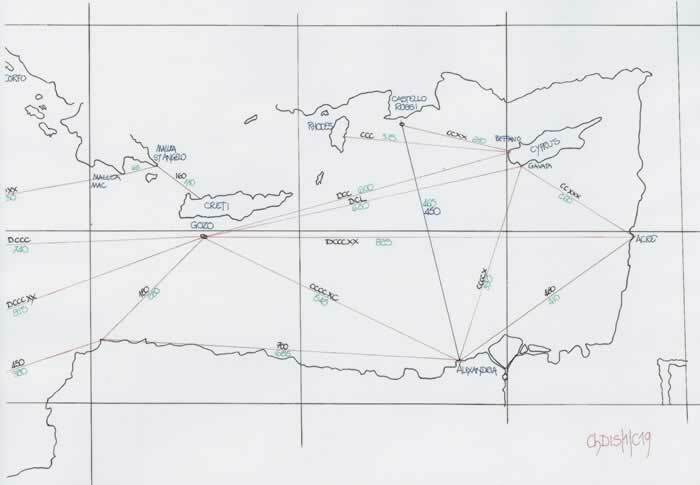 Perhaps the most distorted chart having Carbonara to Cape Bon 62 millara short. The western distances are acceptable, but Cape Bon is 37 millara short. As above but 42 millara short. Bugea and Giberamello reasonably correct, but Cape Bon is 42 millara short. Probably the most accurate with Cape Bon drawn at 195 millara (212 actual), but then to Pantalanea is drawn 30 millara longer than actual and the distortion continues. Quite distorted with Cape Bon 47 Millara short. The above simple presentation of the facts concerning the drawn chart distances south of Sardinia serves but one purpose, that of showing from c1300 to c1464, some 150 years the errors in LCN which are the basis of the whole Portolan Chart distortion were continuous and not one draughtsman was aware of the problem even taking into account F Beccari’s comments on his 1403 chart. That P Vesconte on his 1311 chart knew where geographical north was (see ChMAT/1), drew his wind rose with NSEW clearly marked and thus possibly knew that the eastern section of the chart was awry only leads me to the conclusion that most were copyists of an LCN text and had no actual knowledge with which to challenge its words, or the end result which can be drawn from the Peleio data. Upon three sheets, diagrams ChDIS/1/D17, D18 and D19, form the basic chart, C9. 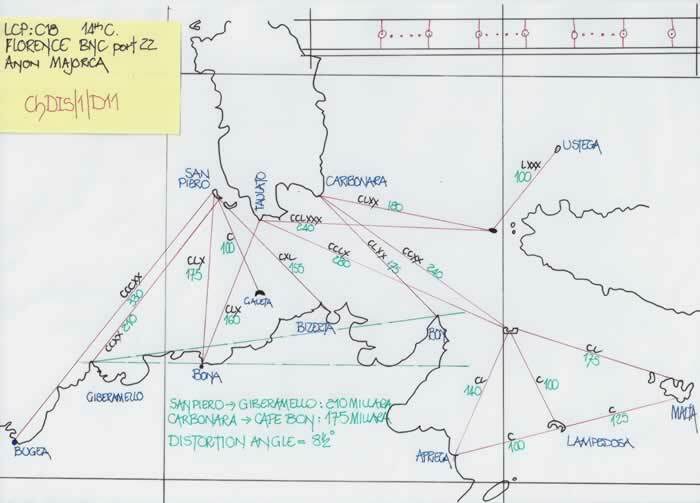 They illustrate the Mediterranean Sea from Cape St Vincent to Acre, and I have appended a sample of the 73 Starea Peleio distance directions, included again the distortion routes south of Sardinia, then linked them to the eastern Mediterranean Sea area. The LCN distances are written in black and the corresponding chart measurements in green. Thus not only can the differences in the distances be observed as written and as used by the draughtsman, but the obvious scribal errors in the extant LCN can be shown to have either been corrected (highly unlikely) or a less corrupt version of LCN was available. No doubt along with a text there was a template chart to assist with drawing the coastal forms as there is no textual data available which describes a coastal form, be it bay, headland or other feature. This template chart would no doubt have been of small scale and size, easily copied with the LCN text and sold as necessary. But I suspect it provided the whole coastal design for these draughtsmen. Without subjecting every distance/direction given in the extant LCN to minute scrutiny and adjustment we will never know the ultimate accuracy of the “Alpha Chart” and “Alpha LCN”, which I believe existed well before 1200AD, and quite probably before 1000AD, but I can at least opine they must both have been of excellent accuracy. The individual draughtsmen of these charts were skilled, but lacked any actual knowledge of the “true” shape of the Mediterranean Sea basin and hence the horrendous error made by scribes in detailing Gozomalta/Gozocreti/Acre as a straight line east/west, has caused untold numbers of texts to be written which try and fail ignominiously to unfold the mystery of the charts distortion. Why nobody actually drew the LCN Peleio data to find the chart since its transcription in the early 1940’s is a mystery to me. Notwithstanding the J T Lanman attempt which was embraced by many researchers and paraded as a certain proof in texts and books, those persons and historians who cannot or would not draw a chart are with LCN’s scribes as much to blame for the mis-information written over the century. The happy acceptance of a possible solution, when that written is not understood, is a greater research problem. Thus I conclude as a final chapter to these several papers concerning the LCN and Portolan Charts, a review of the original research text within History of Cartography/Book 1 / C19. I consider this a necessity as the original text is nearly 30 years old, and is still available to download without having been revised, and as there are many changes in our knowledge these require to be made to the text. However, it is surely incumbent upon the original authors of the HOC chapters to demand a rewrite to correct the information then included and ensure such an iconic “History” is not prejudiced by being out if date. HISTORY OF CARTOGRAPHY, BOOK 1, CHAPTER 19, PAGES 380 – 386 inc. There is within this HOC chapter a revue of the situation apropos Portolan Charts, but that is all it is, a revue, there is no primary research used in the sections and it is, or appears to be no more than a re-iteration of other researchers work. But, the original brief may have been to produce just that, a revue. However, certain sub-sections do contain excellent insights into the possible raison d’être for Portolan Charts, but that comment must be tempered with the requirement for factual research, not assertions and deductions from a trawl, quite necessary but flawed, through the then extant texts as nothing could be tested and questioned. Therefore it is necessary within this text to highlight the problematic areas of Chapter 19, pages 380/386, using the sub-headings from that text as the guide. Page 380; The original compilation of the Portolan Charts. The text commences with, “Among the research problems connected with the Portolan charts, the question of their origin is perhaps the most intractable. (footnote states; though we do not necessarily have to be as pessimistic about the chances of solving it as is Youssouf Kamal, Hallucinations scientifiques (les portulans) (Leiden; E J Brill, 1937), 2.) 1937>1987? Thus we have a laudable stated desire to investigate the Portolan chart in all its aspects; but does that occur, it is again no more than a ramble through the then extant texts, which may or may not have been correct. Surely only primary research will answer those questions and that requires being able to draw a chart and use the mathematics required to ascertain its construction and not take a partisan view. The stated desire has not been fully addressed over the 30 years which have followed, as the research follows the same lines. In the next sub-section, “Ancient origin” we read; “ It is, however, to the worlds of ancient Greece and Rome that we have most often been directed in the search for a solution to this mystery”. Then, “Yet the name most frequently mentioned is Marinus of Tyre, known to us through the writings of his near contemporary, Ptolemy”. In a few short sentences we then read; “but there are weighty arguments for considering the Portolan charts to be compass inspired (as discussed below, pp384/385)”. Finally this section of the text ends with; “A theory of Roman origin has, however, recently been revived by Georges Grosjean. His contention is not that the Romans produced sea charts as such but that a dependable scaled map of the Mediterranean would have been the indirect result of Roman centuriation. This hypothesis has two major weaknesses besides the absence of irrefutable evidence. First, current archaeological findings indicate that no more than sections of the Roman empire were centuriated, and second, even Grosjean admitted there was virtually no trace of Roman influence in the Portolan toponomy”. Thus “ancient origin” is dealt with in a lightweight manner, not to be considered, however, there is not a single mention of Roman Itineraries, Roman Maritime knowledge and the fact that their sailing exploits for trade and conquest means they had an undeniably real knowledge of Mare Nostrum. Look at the Roman data for North Africa and there you will find a coastal road stretching from Tangier in the west to Alexandria in the east, with each section carefully measured from point to point. That alone gives the opportunity for co-ordination between sailing and land distance measures and would certainly provide infill measures for coastal sections that were not accurately or even actually noted in an itinerary. The Roman technology grew out of Greek technology and they measured the oikoumene. Thus while Georges Grosjean may have completely mis-stated his case for a Roman origin, the point he has made has been completely misjudged by Portolan historians in that Roman surveying both on land and sea is well done and well recorded by the likes of Pliny the Elder who shows they actually produced a comprehensive measurement of the Roman Empire which encompassed Mare Nostrum, the Mediterranean Sea. A simple open mindedness regarding this text would have helped answer the question, whence came the Portolan chart? My texts cgPL/1 and cgPL/2 fully detail the work by Pliny the Elder. Moving on in the HOC text the next sub-head is “Medieval Origin”, and it immediately skips the period from700AD to 1000AD, the formation of the mercantile states to a later date; “the argument moves on to the medieval period. The “medievalist” school is generally agreed that the Portolan charts originated in the period leading up to their first documented existence in the late 13th century”, and thus we are left to conclude agreement regarding when, although perhaps a rather “non researched agreement” for such a decisive dating; collegiate agreement at its worst! I am somewhat alarmed; R B Motzo carried out his work in the mid 1930’s and originally published in 1936 and 1942, but the 1947 date is always quoted. That difference counts! Many will be aware I have already examined and commented upon LCN, but I still consider it necessary to comment upon this text and its context. Thus I intend to follow the Chapter 19 text line by line on pages 382 and 383, with comments as necessary. 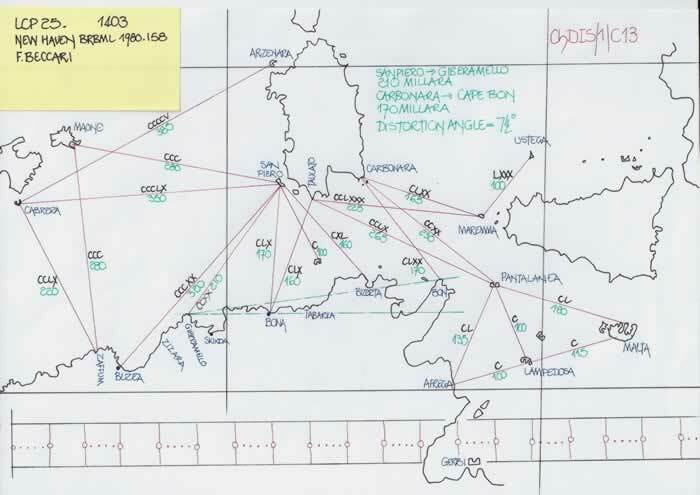 There-in is the basic truth regarding the Portolan chart that it is drawn from the LCN data, and yet from 1947, not one researcher has drawn the data to investigate that idea. 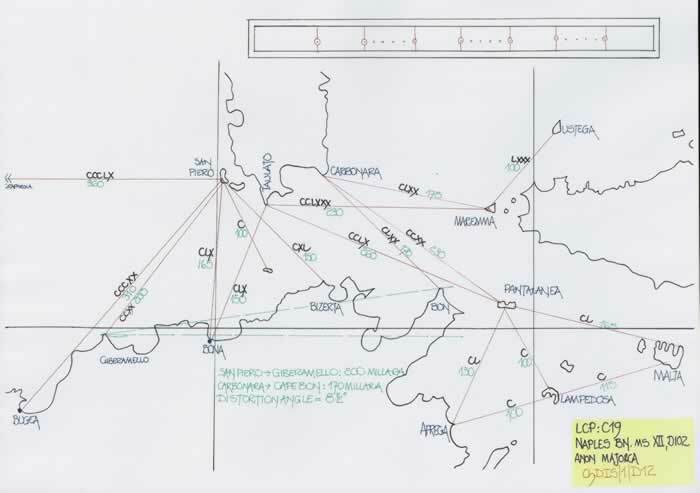 If my texts ChCPC/1, ChMAT/1 and essay ChEPC/1 are studied it will become so very obvious that the Peleio distance/directions given in LCN could not have been produced by a mariner sailing and measuring both distance and direction as accurately as the LCN text indicates. They are in fact the result of an LCN author measuring them from an accurate chart. I cannot comment upon the authorship of LCN or the first chart as I make clear in my ChEPC/1 essay, as I believe it stems from a totally different period in the history of maps, in fact several centuries earlier. 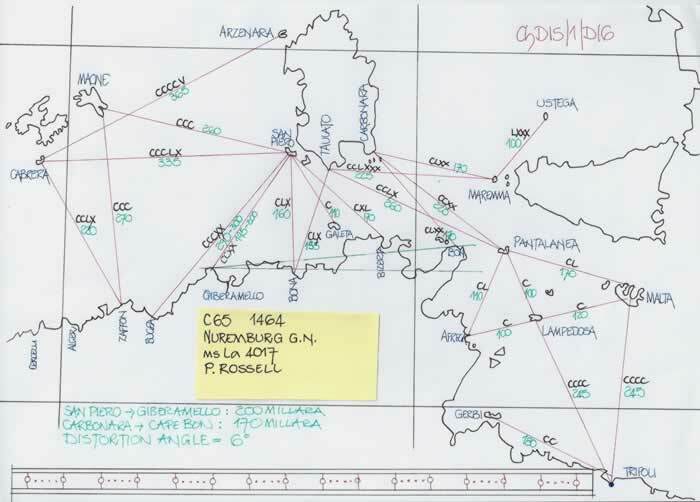 However, following on HOC p382 discusses place names within LCN and particularly Agosta (Augusta), Sicily; Aigues Morte, France and Manfredonia, Italy. I have already discussed Aigues Morte and the fact that Charlemagne established a lookout tower there in c790AD and its usage as a port, but why in a footnote confirm “it was already referred to as a port in 1226”, when the whole text is pointing to King Louis IX and a later date. Thus he purchased a working port which could be used immediately. In my estimation this somewhat negates the importance placed upon toponyms as guides to dating. Surely many are written when the opportunity arose, not out of necessity. Then HOC p382/383 text makes a huge leap to inexact research with the following text; ”Thorough comparison, however, of the toponymic lists extracted from LCN and Carte Pisane exposes notable discrepancies, and these make Motzo’s thesis less appealing.” The fact that this comparison took place is worrying as the Chapter 19 author appears to have decided that Motzo’s statement must mean the Carte Pisane and LCN are inextricably linked and thus should accord, even though previously he has clearly stated that the prototype chart is not necessarily the Carte Pisane. Until now HOC chapter 19 has not in my opinion, from the evidence presented, shown that the two are in fact linked other than by spurious dating coincidence. Where is the research explained in C19 that could lead to this being considered a possibility? However on page 383 the following sentences show a complete lack of knowledge of LCN. We read, “LCN’s strange lacunae, involving whole stretches of coastline”, when in fact these are StareaPeleio routes spread throughout the text as I have indicated. The example given is Manfredonia to Fermo, but this is a complete nonsense. Firstly LCN, folio 21, gives Barlecto to Sipanto, not Manfredonia, then Sipanto to Monte de Sancto Angelo and thence to Bestij,(Vieste) a bom porto and finishes with, De lo monte sanct angelo entro a la citta de Fermo CLXXX millara per maestro ver lo ponente. Thus there is an evolution of data within the LCN reflecting the actual sailing at the time the original was written and it therefore need not in any way be identical to a chart. What was important to the LCN author is the crux. I can only point current researchers in the direction of my texts, ChLCN/1, ChCPS/1, ChCPC/1 and ChMAT/1, where the whole of the LCN text is discussed and fully illustrated, both StareaPeleio and Peleio sections. However it is pertinent to add that on the Cortona Chart both Barlecto and Fermo are written in red as if confirming the above point made. 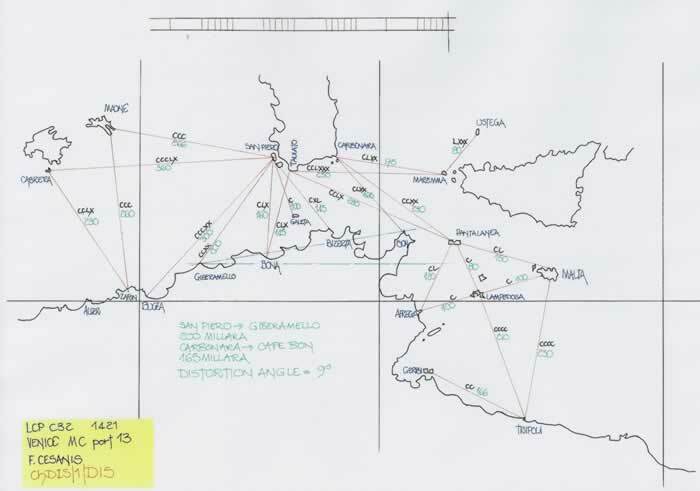 But the next example of supposed Lacunae is perhaps the most bizarre where the C19 author complains that; ”given the importance of Genoa at the time, it is surprising that LCN should omit the ports between Savona and Genoa which are invariably named on charts”. This is not an argument that should be accepted. These two ports are only 30 millara apart and are visible on a fine day across the Gulf of Genoa. The intervening ports are thus within a stone’s throw of both Genoa and Savona and it is only 20th century thinking which considers they should all be written in every text and on each chart; nonsense! The fact that the HOC text then complains that the cities of Arles, Amalfi, Rimini and Sousse picked out in red on the Carte Pisane are not mentioned in the LCN only compounds the nonsense being written that all toponyms equate. There is no necessity for a link as mariners would know of minor ports between the major ports and if they were hardly used, or even hard to use, not require the information. Leaving Genoa, why do you require to be told of a port 5 millara west! Continuing with the HOC text,” It has often been assumed that charts were designed to accompany written “Portolano”, or even that a chart was derived from a series of sailing directions. The acid test, of course, is to construct a chart using nothing more than LCN. This has recently been attempted.” This refers to the J T Lanman research I have fully discussed in my text ChLCN/1, and dismissed as not feasible from the extant Starea distance/directions. But in HOC 19, the author clearly states, “The creator of the first chart would have had no mental map against which to test the portolano’s deficiencies, and he would unknowingly have introduced inevitable errors. These would have led to cumulative distortion as he worked around the coast. Given further that LCN does no more than relate one place to the next by bare statements of distance and direction, the predictably angular and simplified outline that resulted from this attempted reconstruction is noticeably dissimilar to the sophisticated coastal patterns found on the earliest surviving charts. Any scepticism about LCN’s potential in this respect must be far greater in the face of the claims made for earlier sailing directions”. Firstly the essence of the J T Lanman exercise was not to produce a coastline with any particular features, merely to research the possibility of the Starea distance/directions to enable a draughtsman to construct a chart. Not one draughtsman or cartographer would consider drawing any detail onto a map or chart until the basic form, even just place positions as dots were on the base material. Drawing any detail before the whole is known is a recipe for disaster; plan then execute. Thus although as I have clearly expressed J T Lanman’s exercise was severely flawed by false data; that is the LCN we have extant is riddled with errors, mostly scribal copying, within LCN is the basic data to enable a chart to be constructed. Thus charts could well have accompanied Portolano, and in fact I would clearly opine that they must have been attached given the extant Portolan texts deficiencies, as I have already stated above. Finally on p383, the piecemeal creation of a chart is discussed. This is the cobbling together of smaller charts/sections of the Mediterranean Sea into a single chart. I suggest my text ChCPC/1 is studied as it clearly refutes this idea and indicates a homogeneous chart drawn from an earlier LCN text which provides for a flowing matrix from west to east to form the whole chart. I do not consider it worth discussing the use of the compass to construct a chart, or the fact that some scholars have claimed the distortion within a chart is due to magnetic variation. 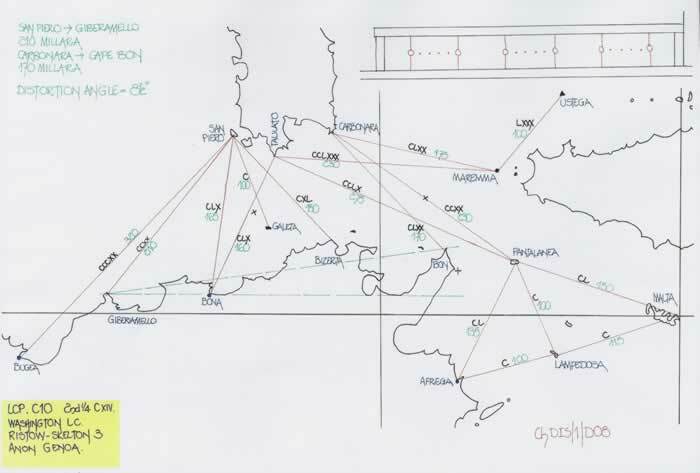 There is no magnetic variation within the construction of a Portolan chart, the distortion, as has been clearly shown is solely due to the LCN scribal errors in the region south of Sardinia. Thus any cartometric evaluation of a Portolan chart is merely reading the basic distortions. I am now including various footnotes, 129, 131 and 134 and suggest they are a pointer to the complete folly of researchers not drawing charts. Thus my findings fully explained in previous texts of distortions from 4 to 12 ½ degrees had already been observed but not one researcher looked for the obvious reason. It will not come as any surprise to readers of this text that I find the above assumptions drawn from studying the Portolan charts to be without foundation. I have continuously stated that the Iberian Peninsula is drawn foursquare, denoting true or geographical north just as the Wind Rose appended to these charts illustrates. Thus I consider that texts such as these should be given a warning symbol for all future researchers to avoid. The next sub-head “The Projection”, is on page 385, and states “the generally agreed situation” that charts are “projectionless” and any meridians or parallels are straight lines. My summation is simply this; the charts are drawn from actual distance measurements and directions taken from LCN, which were taken upon the face of the world, a globe. That means if they were perfectly accurate and set down upon a flat paper, any corresponding graticule would in fact show a slight distorting curvature. However given the scale of these charts and the in-built inaccuracies the minor curvature which we should read upon these charts is lost and they become projectionless. However, a graticule can be overlaid which indicates what should be expected on a map or chart. The fact that the graticule is rectangular and has a ratio which although varying slightly chart to chart (normally from drawing inaccuracies) is generally 5:4, latitude to longitude and represents the natural centre of the Mediterranean, 36N latitude, thus as the distances were measured on a curved earth surface this can be considered a natural occurrence. It is obviously a very broad brush approach that had to be taken to cover such a wide-ranging subject. But in doing so it became impossible for the author to focus upon the main topics and discuss them in a detailed manner, a fact which is lamentable even given the texts available at the time. But as no doubt the editors limited the word count and the fact that extant texts in 1987, although being divided into pros and cons for a given topic are a spectacular failure in answering the fundamental questions vis a vis Portolan charts, and, coupled with the “collegiate” attitude of acceptance of texts by “experts” without reducing them to their constituent parts and testing them, has led to major errors as already discussed. I would urge that the HOC committee offer the original author the rewrite option. LES CARTES PORTOLANES pp 510 & 511 (part); The Medieval Birth of Nautical Cartography; The Technical Grounding; Portolans and Portolan Charts, from the compilation of information to its graphic representation (part). The text commences; “In my view, then, which is shared by most present-day specialists in the subject, we should not seek the origins of medieval nautical cartography either in Classical Greece or the Roman World nor even in the intermediate role that Byzantines or Moslems played. If we take this ruling out as our departure point the task of determining when and where this new technique of realistically representing space developed becomes that much simpler. Not only do I fundamentally disagree with the above statement, but can state categorically that the detail given on the Portolan Charts of c1300 could not have been acquired other than from a “Portolani”, as good as “Lo Conpasso de Navegare”, which enabled the construction of these extant charts. However, the exactitude of measure and direction which had to be available c1200/1250 for the extant copy of LCN to be written could not have been obtained other than by thousands of measurements both land and coastal, thousands of sketches of coastlines and a body of people capable of assembling the data into a cohesive “Portolani” and “Portolan Chart”. The only time in history any peoples have been able and capable of carrying out that task, are those of the Roman Empire. Even the latter-day “Church” with its “geographers” could not have carried this survey out, but they could have combined the data to a coherent text as we now read. City states, small maritime powers of the early medieval period could not have and did not have the expertise to carry out the task. There tools were just not adequate for such accuracy and they were also very busy fighting each other for trade supremacy, fighting Moslem pirates and above all trying to forge trade links. I would remind you of the LCN route from Cabrera/Grapparola to Arzenara, which is distance and directionally correct and is described down to the finest of degrees for the actual bearing; it is nearly perfect. Thus it can only have been read from an accurate chart as it could not have been assessed by sailing the route in a direct line, and thus a magnetic compass was not used as it would have read some 8 degrees adrift for the routing. I therefore totally reject the LCP paragraph above and its interpretation. The first paragraph of, “Technical Grounding”, states; If we begin with geographical knowledge, the first problem to be faced is how to ascertain what kind of information lay at the foundations of the medieval nautical cartography building. In this context, the studies by Julio Rey Pastor and Jonathan T Lanman (following what was already an old idea) fired a broadside against theories that had defended the use of different kinds of projections. They were right on target when they pointed out that on all nautical charts from prior to the 17th century they had managed to study there was a clear deviation from the Mediterranean axis of between 8 and 10 degrees, which on the one hand ruled out any possibility that latitude calculations had played a major role when it came to drawing charts. And on the other, the fact that the degree of deviation coincided with that average magnetic variation in the area at the time (measured on the basis of the lava from the Volcanic eruptions on Sicily and Ischia) was irrefutable proof of the part played by the medieval magnetic compass in the process of collating the information needed to produce these works”. If you require any further proof than in my ChLCN/1 text and the deviation data for the 10 charts discussed here-in, then I suggest you carry out a drawing exercise and learn the irrefutable proof of the distortion not deviation. The whole of the text LCP page 510 is based upon a magnetic reading for direction as has been made abundantly clear from the above text, but the following paragraph indicates a complete lack of technical knowledge and time-scales involved. So somehow one person did all of this in the twinkling of an eye timescale, rubbish! The text then progresses to the “Wind Rose”, which I have already covered sufficiently in my two texts, ChWR/1 and ChWR/2. Thus I can clearly opine that the “winds” are the basis of “Portolani” texts as clearly illustrated, but the wind directions on a “Portolan Chart”, because of the distortion skewing part, it would only lead to a calamitous sailing direction which no magnetic compass will assist with or eradicate. The “Windrose” is set NSEW and is generally correct for the western Mediterranean Sea area; it is incorrect for the eastern Mediterranean Sea area by the distortion factor of each individual chart dependent upon the accuracy of the measurements south of Sardinia to the N African coastline. This is clearly shown within this text. The next subhead and its first paragraph are the crux of my disagreement with this section of Les Cartes Portolanes. “Portolans and Portolan Charts: from the compilation of information to its Graphic Representation. An old hypothesis that has been repeatedly defended by some authors and rejected by others contends that charts are merely the result of transferring information on distances and directions, previously systematised in portolans, to a graphic format.64 Nonetheless, in recent years the idea has come to prevail that the first nautical charts emerged at the moment when people began to compile and fit together partial maps of the different basins that constitute the Mediterranean, which ship’s officers had begun to do at an early stage. 65 But, while from the viewpoint of the 20th and 21st centuries that might seem to be the most likely option, I believe it is difficult to uphold. 64 = the idea had already been defended by Kretschmer and was taken up again by Lanman with new arguments. 65 = this idea was put forward by Nordenskiold and, combined with support of portolans, also by Kretschmer. It has been clearly shown that the Portolan Charts are quite simply in agreement with the distance/directions within LCN and must thus have been drawn using that data. It is inconceivable that so many charts, i.e. LCP C1 to C64 should accurately reflect the LCN data without it being incorporated as their backbone matrix data. The only questions to be answered are whence the data came from and what came first, the data or the chart? A new text to follow this, ChCOR/1, deals extensively with the Atlantic, Mediterranean Sea and Black Sea differences in scale which are in effect clearly registered upon the Cortona Chart (LCP, C2) with both the Millara scale and an unfinished Roman Mile scale set at the top of the chart. This text uses LCP pages 511 and 512 as a guide for the continuation of the storyline. It is obvious that if Portolan charts had been assessed against the “Portolani” texts much of the research work carried out would not only have been unnecessary, but, by now a proper understanding of what a “Portolan Chart” is, would have been achieved. By drawing the Peleio data which I believe had never before been attempted, the basic matrix for a Portolan Chart is exposed. It matters not that the “Liber Existensia” is dated c1204 and is written so very differently to the LCN text, as a link between the two cannot be established other than subject matter. The extant Portolan Charts have a commonality of distance and direction drawn from a similar source, although perhaps a variable copy, and rely on an “Alpha” or master chart for their information on the portrayal of coastlines. 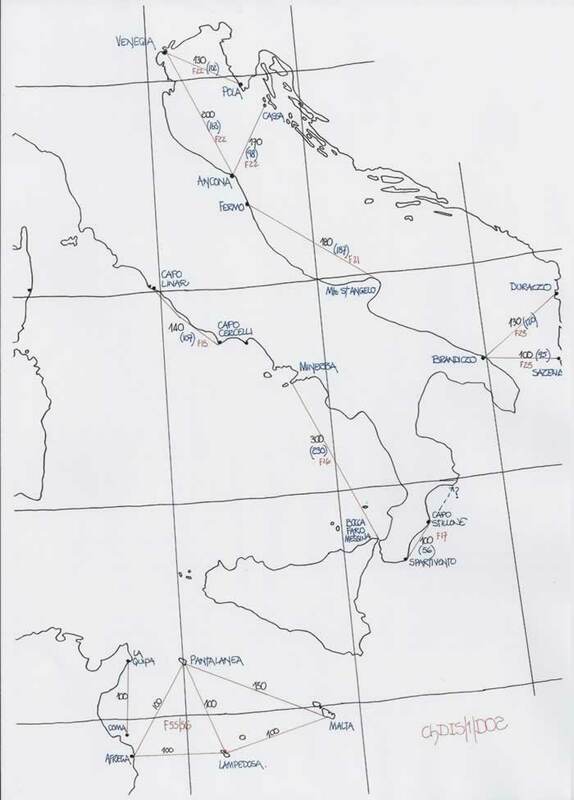 That “Alpha” chart was not compiled by mariners from their own sketches but copied, probably in a monastery in NW Italy from a Roman Original, with Roman Itineraries to aid the compilation of coast to land measures. Thus the extant charts 1300/1500 should have been noted as drawn from a basic “alpha text” and “alpha chart”, as I indicated in the two papers regarding the first 10 charts mentioned in LCP, by showing the virtual copying when the scales were equalized. I indicated that the distance measures along the N African coastline, particularly from the Isle of Djerba to Alexandria were a fundamental truth. This was not even mentioned in the several years that have followed. Then I moved on actually spelling out the “alpha” document and its necessary “alpha chart” indicating that LCN, in one or more copies was the base of all extant Portolan charts. The Peleio section in LCN is taken from a chart drawn before 1250AD, (if R B Motzo is correct in his predating of the extant LCN), and obviously at one time in the distant past was a very accurate text. Thus the whole overblown storyline of magnetic deviation would have been obviated if the recognition of the distortion factor caused by the scribal errors in LCN had been investigated by historians, and not ignored. 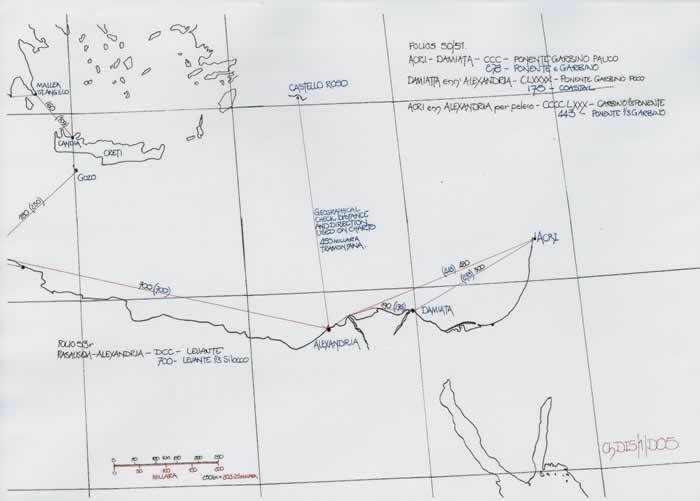 That variation noted as the difference in distance from Carbonara to Cape Bon, caused from 4 degrees to 12 ½ degrees distortion in the eastern section of the charts. It is a simple error easily recognised if the training of researchers included draughtsmanship and just to measure from a chart. Had the LCN text been recognized as the “alpha” text, by now I would have hoped its origination would have been assessed and the dating of the charts naissance been made. I hope there are researchers capable of finding the lost texts in the libraries of Europe and in particular of Italy. That should also include the obvious Roman “gazetteer”, which morphed into the medieval “gazetteer” to list the ports and the coastal landscape features. > Only one people have had the technical ability as well as the opportunity to complete a survey, and are known to have used maps, both for political and military reasons. > That knowledge, although perhaps only historically, ended c400AD but was continued in textual form by a new empire, the “Church”, who became the new state. > Well recorded is the constant copying of texts by the “Church”, texts from centuries earlier, such that even in c700AD they were being distributed throughout the outer reaches of Europe. > A transitional period in the 9th century saw the resurgence of maritime trade, far simpler to move goods by sea than on ancient roads which had deteriorated to rutted tracks. > Thus the necessity for maps and texts informing these new travellers, mariners, of the wider Mediterranean Sea became a necessity, and no doubt the “Church” saw the monetary gain. > Then the “religious houses” grew to produce many texts, Religion became an opiate, the crusades were started and large numbers of ships were required and full route information. > The charts and texts for sailing were copiously copied, errors abounded in that copying frenzy and the extant LCN is the resultant, although its complementary chart is perhaps lost. > Magnetic compass usage was at best rudimentary and unable to provide good data, other than a general idea of where north was approximately. In 1300 it never pointed to true north! > There is no magnetic deviation on a Portolan Chart; it is distortion from scribal errors. > It is a misnomer to consider that the cartometric exercise tells you anything about a Portolan Chart. All you have looked at is a distorted chart and measured the distortion. > The existing charts are probably “library” usage. If “owners” can complain of the distortions and wrong distances in 1403, for how long did they know of the problem and would they thus trust these charts, even in a basic format. I suggest most used onboard were small scale, and small sized sections of the Mediterranean Sea, easy to use. Try handling a map 600mm x 1000mm on a wobbly surface and having to twist it continuously to read the toponyms. Try reading the toponyms in a half light, and ask why so many are required on a chart? The mariners would not require every minor port to be noted, problem areas yes, but the overkill of toponyms suggests usage by persons who did not know the coastlines, thus all are noted. Therefore it is probable with new found wealth these charts were trophies. 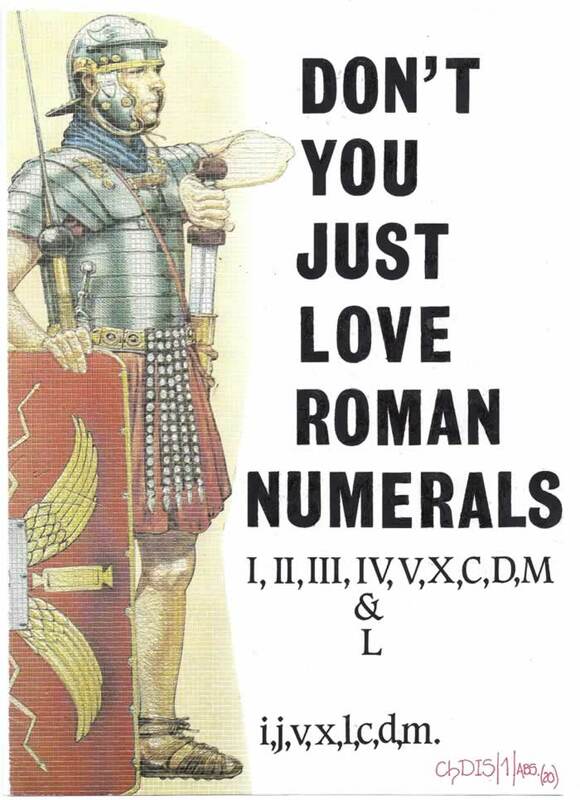 Page 421 of LCP has the following footnote regarding Roman Numerals and their usage. I will remind you that the whole of the skewing problem for Portolan Charts is down to the usage of Roman Numerals. Diagram ChDIS/1/D20 is the antithesis of the problem! I cannot stress how important the miscopying of Roman Numerals has been on documents, even Roman Documents that have been continually copied. They are dangerous! I urge all researchers to learn to draw, even rudimentary sketches to scale will enable a greater understanding of the details given in LCN and thus a better understanding of the Portolan Chart. Thus the scales can be used and an understanding of the Wind Rose, its use as a scale bar, not just as an adornment will be understood. Read my texts, ChLCN/1; ChCPS/1; ChCPC/1; ChEPC/1 and ChMAT/1 and if you do not agree with my findings, prove me wrong. Just prove something that is contradictory so that we can move forward and rid the record of the texts which are no longer correct and encourage new researchers/students to a correct path of research. M J Ferrar February mmxvi or 2016.